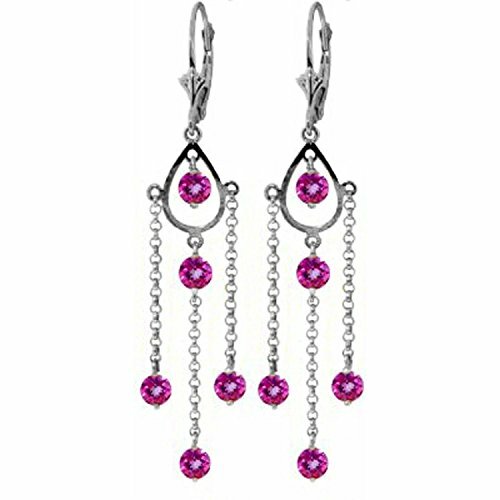 These fabulous 14k white gold chandelier earrings with natural pink topaz are fun, flirty, and girly, making them a wonderful choice for any woman who wishes to show off her feminine charm. Leverbacks designed in your choice of yellow, white, or rose 14k gold allows these earrings to dangle, swing, and move, perfectly showing off the glamorous pink gems. A total of ten round cut pink topaz stones are placed beautifully along the earrings, with dangling chains to fully show off the luxurious look of these gemstones. Three carats of sparkle make these earrings dazzling to wear for any occasion.